The process of controlling various operating equipment, machinery, factory operations, etc., automatically (sometimes remotely) using control systems can be termed as automation. Automation is an efficient method to use in every field such that to reduce manpower, energy usage and also for improving the quality and efficiency of any system. There are various emerging automation applications and a few can be listed as home automation system, industrial automation system, automated mining system, automated waste management system and so on. What is Home Automation System? Home automation system is one of the automation systems, which is used for controlling home appliances automatically (sometimes remotely) with the help of various control systems. The home automation systems are used for controlling the indoor & outdoor lights, heat, ventilation, air conditioning in the house, to lock or open the doors & gates, to control electrical & electronic appliances and so on using various control systems with appropriate sensors. There are various types of home automation applications, let us discuss a few typically used home automation systems and the importance of home automation in this article. The main intention of this project is to develop a home automation system using RF technology. 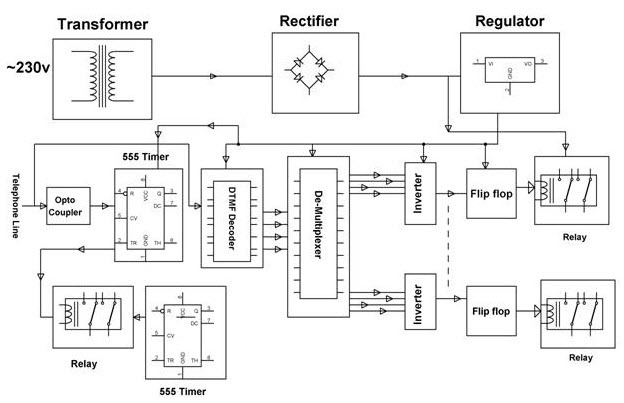 The RF based home automation system consists of RF transmitter and RF receiver blocks as shown in the figure below. The push buttons of loads or home appliances are interfaced to 8051 series microcontroller through which the command signals transmitted through RF transmitter after encoding command signals. 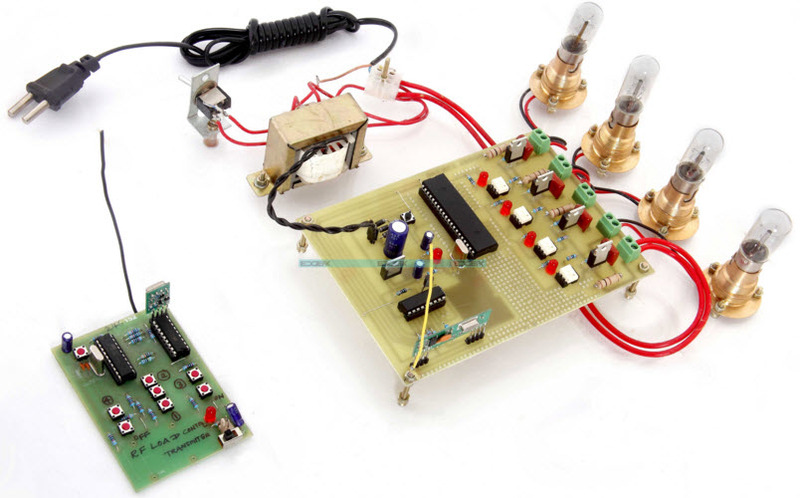 The RF transmitter end is an RF remote can be used by the user as a remote control for operating home appliances. The receiver end consists of the RF receiver circuit which consists of a decoder to decode the encoded command signals received from the transmitter. The decoded signals are fed to the microcontroller and then the commands are sent to operate loads through Opto-Isolators. The main purpose of this project is to develop an Arduino based home automation system with Bluetooth. 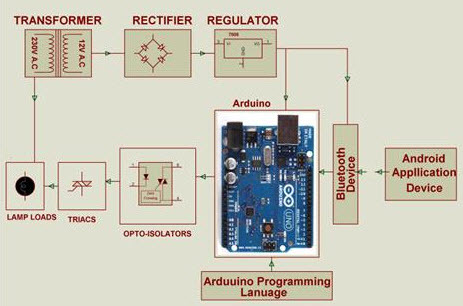 The Arduino based home automation project consists of receiver end at which Arduino board & Bluetooth device are interfaced. The transmitter end, cell phone application is used to send ON/OFF command signals to the receiver. Thus, by receiving these commands from cell phone application given by the user. 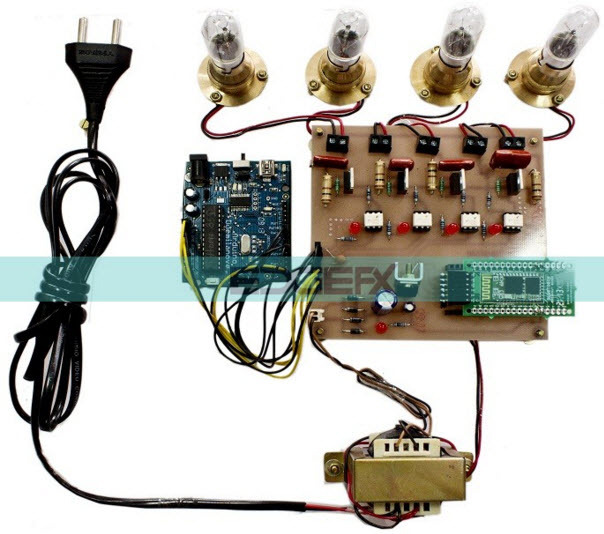 The loads can be turned ON/OFF remotely using Arduino based home automation project. The main intention of this project is for controlling various electrical loads remotely over internet using Internet Of Things (IOT). The smart phone android application with user configurable GUI front end can be used for real-time scenario. 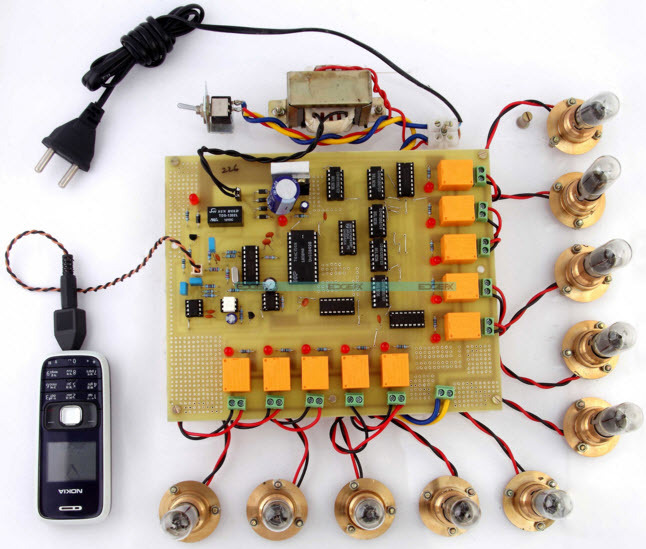 The home automation system using android cell phone project consists of various blocks as shown in the block diagram. The touch commands are given from the mobile phone and are sent to the nearby wireless modem using allotted IP. The WiFi module receives these commands and fed it to 8051 series microcontroller interfaced to it. 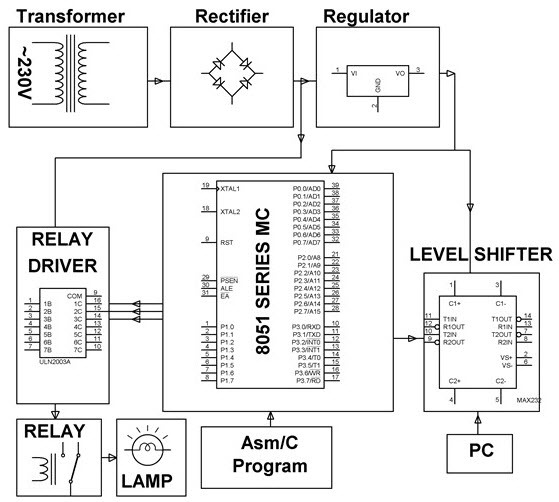 The relays interfaced to the microcontroller through relay driver are operated based on the commands received. Thus, the electrical loads are operated (ON & OFF) and the status of loads either ON or OFF can be displayed at sending end over the LCD display. The digital control based home automation system is intended to control remotely using landline connection. In this project, home appliances can be controlled through landline by dialing the specific number for the specific load. This dial can be done from a home phone or even by dialing home number from outside also. 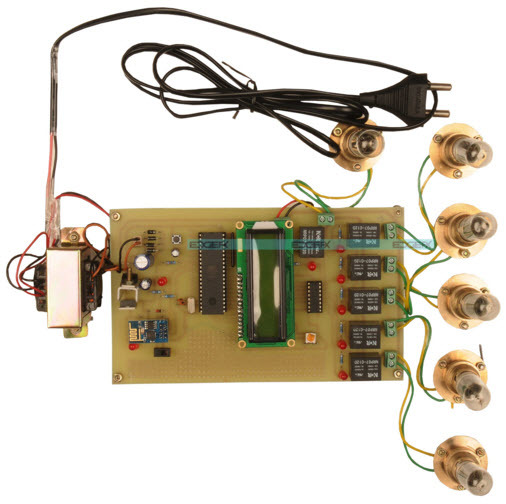 This project not uses any microcontroller instead digital logic using Dual Tone Multiple Frequency (DTMF) technology is used to receive commands from a landline phone for developing digital output. The digital output developed is used for actuating switching mechanism through relay driver. Thus, the loads or home appliances can be turned ON/OFF. Hence, from anywhere the home appliances can be controlled using this project, the limited range operation of IR based home automation and RF based home automation systems can be overwhelmed. There are few more home automation systems that include voice controlled home appliances, cell phone controlled home appliances, TV remote controlled home appliances, home appliance control with time delay switch, touch screen based home automation and so on. The inefficiency of operation of conventional wall switches can be overwhelmed using various home automation systems (without using conventional switching methods). The loss of power can be reduced and manpower required for home automation is very less compared to conventional methods. The IR, RF, android application, Arduino, Bluetooth, DTMF, etc., based home automation systems can be more efficient, provides ease of operation. Provides safety from electrical power short circuits while using conventional wall switches to operate loads. Home automation system with automated door locking and security cameras facilitates more security. By using a home automation system, we can save a lot of time to operate home appliances from anywhere (without wasting time to move from office to home for just unlocking door for family members to enter the home). Are you interested in designing electronics projects? Do you want to design a home automation system for your home by yourself? Feel free to approach us for any technical help regarding your electrical and electronics projects by posting in the comments section below. May i know the title of your project? Please contact Niranjan on +91-9959178000 for more details. May i know the exact project which you are looking for?